March | 2018 | Mike Lamberti, From Margate To Cleveland, And Back ! 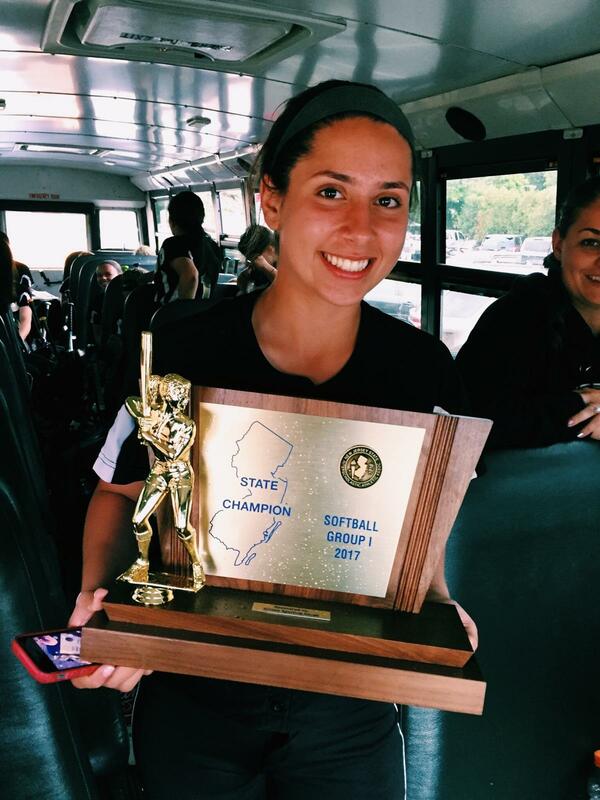 And those attributes are why Cedar Grove High School senior Ava Fernandez is not only a leader in the classroom and athletic fields, but will find success at the next level, and beyond, epitomizing the term student-athlete. 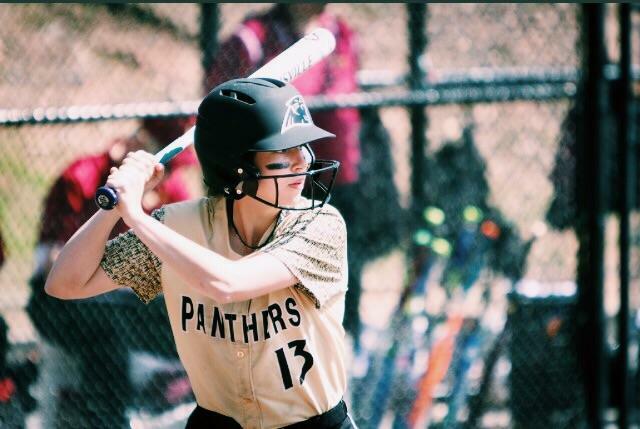 Fernandez will attend Springfield College, in Springfield, Massachusetts this fall, where she’ll continue playing softball while pursuing a major in Sports Management. But listening to Ava, there’s much work to do, before college begins. First is to help Cedar Grove match, or repeat last year’s success on the softball diamond, this spring. And as one of the Panthers leaders, the first baseman can’t wait. Her college choice came down to a comfort level. “My parents were so supportive during the process,” said Ava. “I knew when I made my official visit to Springfield that it was the right place for me. I felt it in my heart. I really liked the head softball coach at Springfield, Kate Bowen. And when I had a chance to spend the night there and meet some of the players, I knew this was the place for me. Springfield has my major, and that, of course, was also very important to me. 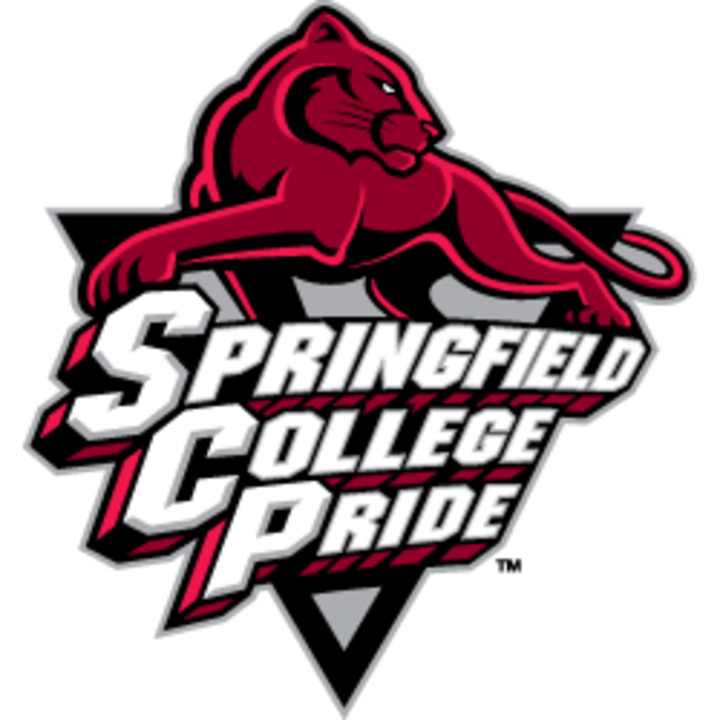 Springfield, whose moniker is the Pride and mascot is Spirit, The Majestic Lion, was founded in 1885. It is an NCAA, Division III school and plays in the highly competitive New England Women’s and Men’s Athletic Conference (NEWMAC). Getting the college decision done, before the start of softball, was something Ava was happy to wrap up. “It makes it much easier to focus on the season, with my teammates,” she said. The eldest of two daughters born to Dina and Joseph Fernandez, Ava has long been a crazy sports fan. 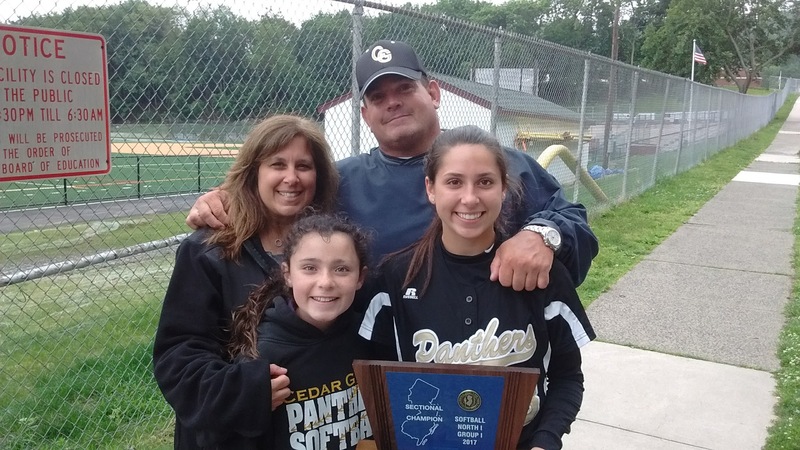 Cedar Grove head coach Nicole Velardi has a lot of respect for Ava. Cedar Grove would win the Group 1 state championship in 2017 and played in the first NJSIAA Tournament of Champions. The Panthers won an exciting first round game in the TOC before losing to the eventual champion, Immaculate Heart Academy, in the semifinals. Velardi also noted that the team has five tremendous seniors, who thrive in a leadership role. In addition to Fernandez, there’s Ava Mandala, Kelly Toomey, Kali McCabe and Michaela Kennedy. Fernandez was also an outstanding basketball player this winter for the Panthers, and in addition, was honored in February, at the ‘National Girls and Women In Sports Day’, at Seton Hall University. She was also a constant at Cedar Grove football games in the fall, working on the sidelines and helping the coaching staff. The record speaks for itself. 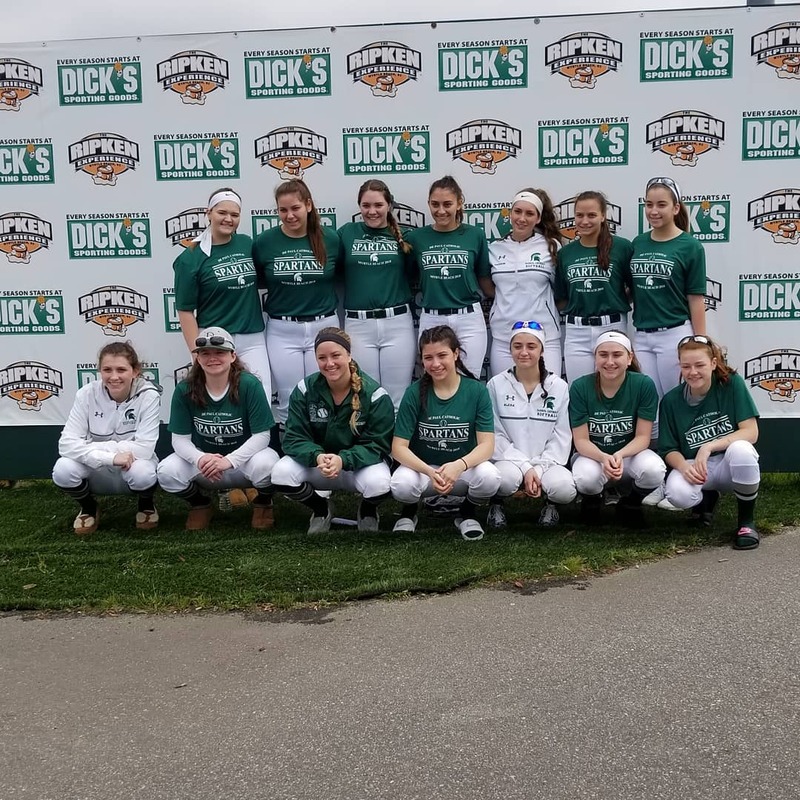 The DePaul High softball team has put together a tremendous run of success, including a record six straight Passaic County Tournament championships, from 2012 through last season, as well as an unprecedented 11 titles in the 36 year history of the PCT. And as the 2018 regular season nears, head coach Sue Parler is optimistic that the team can continue its winning ways. The Spartans traveled to Myrtle Beach, South Carolina for five days of scrimmages and practices last week. The team was slated to return earlier this week and, weather permitting, would be back in action for a scrimmage on March 23, against Morris Catholic, at home, beginning at 4:30 p.m. On March 26, DePaul will visit Indian Hills and on March 28, the team hosts Morris Knolls. The regular season will begin on April 2, when DePaul plays host to Wayne Hills, at 4 p.m. A day later, West Milford visits, also at 4 p.m. DePaul will once again play in the rugged Big North Division, meaning two games each against powerful Immaculate Heart Academy, as well as Paramus Catholic and Holy Angels. Beginning her 23rd season as head coach at DePaul, Parler was looking forward to the team’s annual trip South. It was a good opportunity for the team to take advantage of warmer weather, while also creating a bonding time for this year’s team. The weather, obviously, has been a problem, with multiple storms afflicting the Northeast in March. DePaul was scheduled to play six or seven scrimmages in South Carolina, as well as time for practice. The Spartans lost some talented players to graduation last spring, including Amanda Ayala, who is now playing at the University of Tennessee and Morgan O’Neill, who has continued her career at Mount St. Mary College, in Newburgh, New York. The team’s senior captains for 2018 are Dominique Coiro, Summer Ramundo and Kaitlin Cavanagh. Corio will be the team’s catcher, Ramundo will see the bulk of the pitching and Cavanagh is an infielder. Parler brought 14 players to South Carolina, as well as a large group of parents. The coaching staff remains intact, with Cyndi Covello, Jennie Horwath and Bernadette Wiltshire back returning for a new season. After two seasons of battling leg injuries, Dylan Mulroony of Passaic Valley High came through with an outstanding year for that school’s basketball team. Mulroony, a 6’3″ senior, had shown signs of being a tremendous player during his freshman year, in 2014-2015. Then-head coach Rob Carcich had started Mulroony on a number of occasions, as the Hornets finished 21-7. The following fall, Mulroony went down with a leg injury during football season. He returned for basketball and had a good year, scoring in double figures 11 times, including a high game of 18 points, against Wood Ridge. The leg ailment would linger for Mulroony as a junior. He missed just about the entire 2016-2017 season, before playing in two games the final week of the season. As a senior, it finally came together, as Mulroony, a team captain, led the Hornets in scoring, averaging 19,8 points a game. Passaic Valley head coach Jim Holsworth, himself a standout high school and collegiate player, lauded Mulroony’s talent. “Dylan was really the only kid I saw all year in Passaic County that could score consistently from everywhere on the floor,” said Holsworth. “He could post up, had an excellent off the dribble mid-range game, and could shoot the ball easily from 25 feet away. His ability to rebound the ball, game in and game out, was maybe his most under appreciated asset. Mulroony averaged 19.8 points and 10.1 rebounds this season. He was named by the Passaic County Coaches, and Big North Coaches, a First Team player. His career high was 36 points, in a game against West Milford, on Feb. 6, as well as a 33-point effort in a win versus Passaic Tech, on Feb. 13. “He (also) played superb, in both games against (Paterson) Eastside, where he had 24 and 29 points,” said Holsworth. While his high school career was hindered, Mulroony’s future could still include basketball, He hopes to play on the collegiate level and Holsworth has no doubt he can compete at the next level. Mulroony has yet to decide on a college for this fall. Good company, indeed, for a hard-working player, who saved his best basketball for his senior year. As a new softball season nears, Wayne Hills High coach Rayna Caruso is optimistic about her team’s chances, with some outstanding seniors and a young core of talented players. Wayne Hills began practice on March 2, but the bad weather has limited the team, in getting outdoors for practice and scrimmages. Four scrimmages were already canceled and the Patriots weren’t scheduled to play its first tune up until March 19, when the team hosts Montclair, at 4 p.m. Scrimmages at Westwood (March 20, 4:15 p.m.), Hawthorne (March 21, 4:15 p.m.) and Kearny (March 24, noon) follow. The regular season opener is set for April 2, with a tough game, at DePaul, starting at 4:15 p.m. The first home game is on April 4, when Lakeland visits, also at 4:15 p.m. The beginning of practice has been tough, according to Caruso. 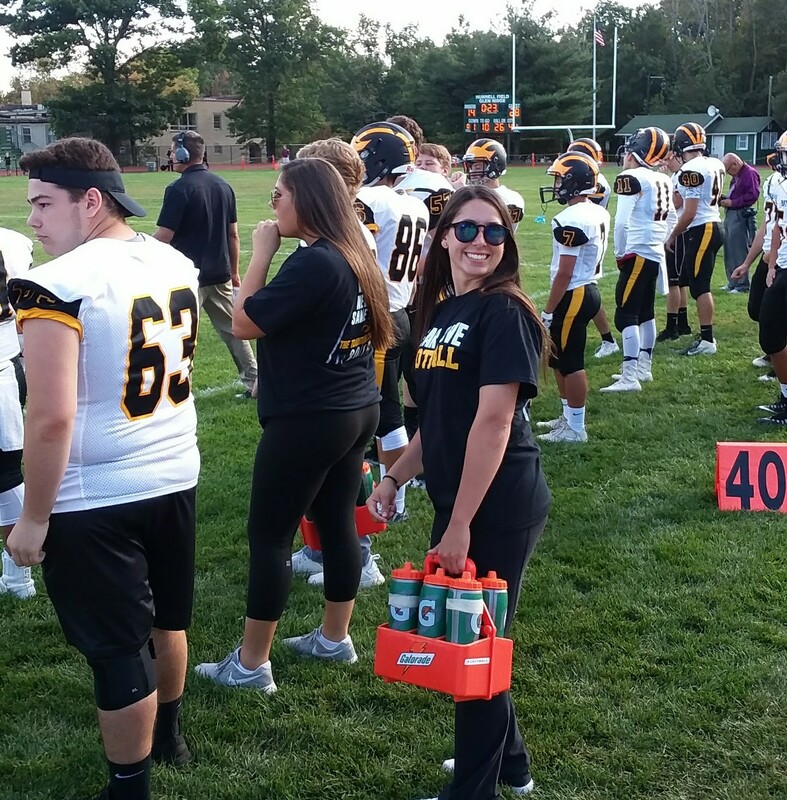 Caruso’s assistant coach is Carly Soojian, a former player at Wayne Hills. Entering this week, the Patriots only had practice four times. There are four returning players in senior catcher Jenna Maguire, senior outfielders Amanda Carey, and Lindsey Mahler, and junior pitcher Victoria DiDonato. “We lost our entire infield, but we are looking hopeful with a few returners and talented freshmen,” said Caruso. 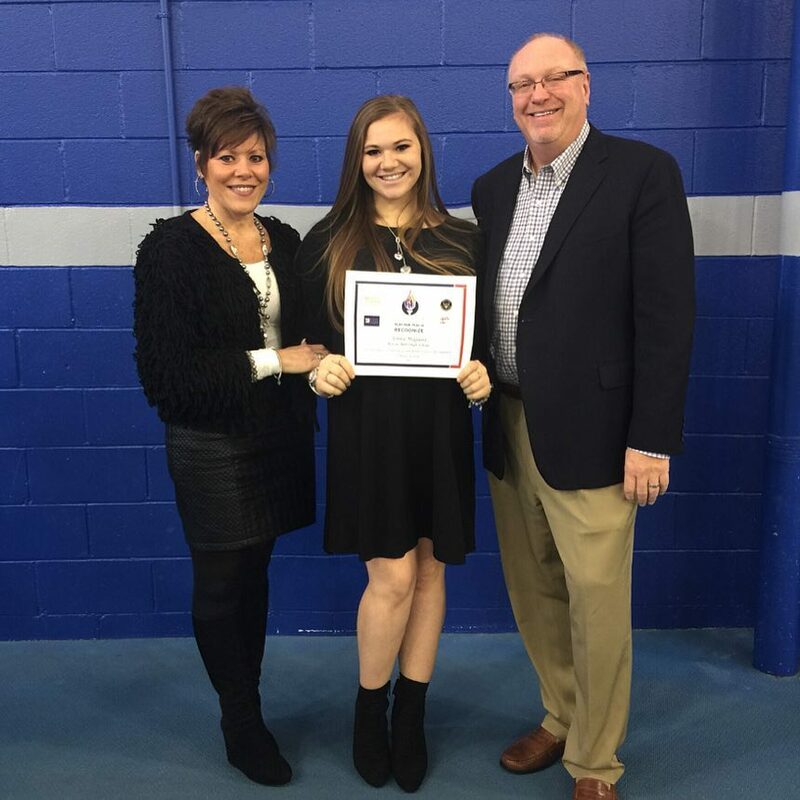 Maguire, who will attend the University of Alabama this fall, was honored at Seton Hall University, during the National Girls and Women in Sports Day, this past Feb. 4, being named Wayne Hills’ recipient at the banquet. In addition to being a standout softball player, Maguire, the youngest daughter of Lia and Robert Maguire, was also a cheerleading captain for the Patriots this past fall and cheered for four years for Hills. On the softball diamond, Maguire had a tremendous season last year for Hills, hitting .528, with six homers and 33 RBI. Behind the plate, she threw out eight base runners and picked off two others. Jenna has a career batting average of .491 and has driven in 71 runs. Maguire was Wayne Hills’ Offensive Player of the Year, in 2017, as well as a First Team, All-County and All-Big North player last season. She was also a second team, All-North Jersey player a year ago. In addition, Maguire has played club ball for the NJ Sparks and Wayne Wildcats, in both the summer and fall. In the classroom, she’s been a member of the Student Council, Future Business Leaders of America and Students Against Destructive Decisions. Months of grueling practices, cutting weight and those never-ending quad matches on cold winter days and nights are completed. 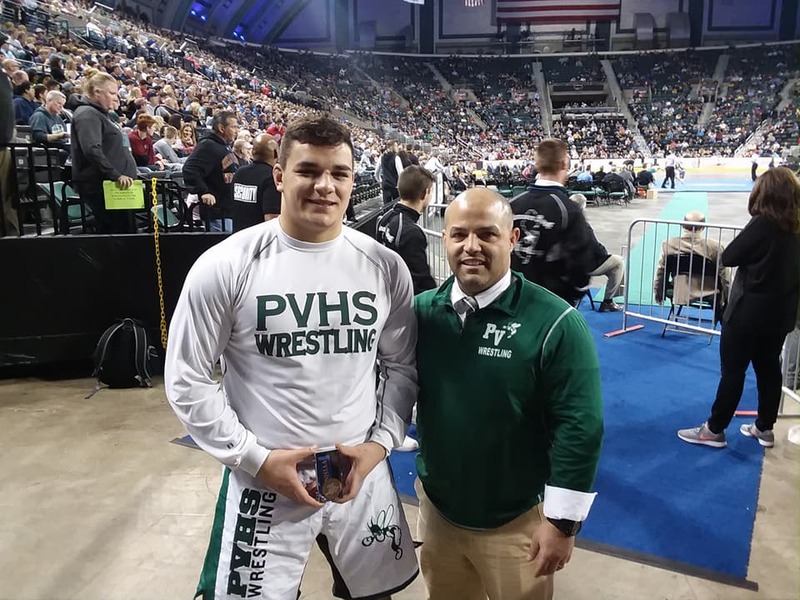 And for the Passaic Valley High wrestling team, the first week in March produced some good results, at the ultimate venue for wrestlers, Boardwalk Hall in Atlantic City. PV had advanced senior captains Yousef Karmi and Tom Maretta to the state championships, at the Jersey Shore. Marretta took home a medal for finishing in the top eight in the state at 220 pounds and Karmi just missed out, but wrestled very well at 285 pounds. Passaic Valley head coach Joe Benvenuti summed up the experience. Karmi battled hard against some of the state’s best wrestlers. “We are very proud of the amazing effort by both our captains, Yousef and Tommy. Yousef did not get a medal, but his best effort was there. He had three amazingly close matches. His two losses came in triple overtime. Yousef has nothing to hang his head about. Heavyweight had 12 wrestlers that had been to the state tournament in previous years. This weight class was very difficult. Karmi leaves our program with 36 wins this season and over 71 for his career. He led our team this season in gold medals and pins. As for Marretta, he joined a rare list of wrestlers at PV who earned a medal at the states. 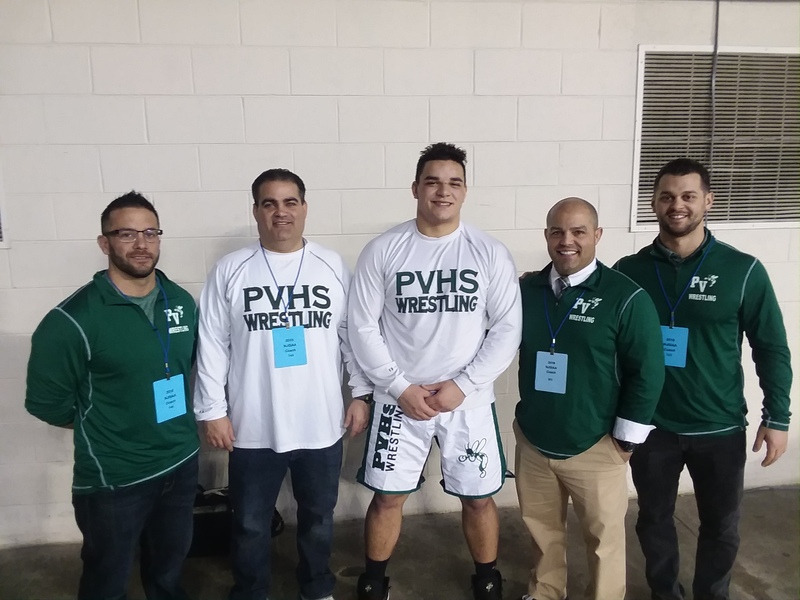 After Nick DeNora medaled last year, this is the first time in eight years that PV has had back-to-back medal winners at Boardwalk Hall. The last time it happened was 2009 and 2010, when Ryan Dunphy and Frank Crocco finished third and second, respectively, at the state tourney. Marretta, who didn’t begin wrestling until his freshman year of high school, capped off a tremendous season, with a seventh place medal. Marretta clinched a berth in the medal round with one of his best all-around matches of the season, defeating a tough Trey Zgombic of Delbarton, by fall, on March 3. A day later, his final match came in the bout for 7/8 in the state, and Marretta edged Cameron DiGiorgio of Christian Brothers Academy, 3-2. Karmi and Marretta will be graduating this June, and Benvenuti will miss their leadership and work ethic. “It really does not get any easier, seeing great kids graduate and move on each year,” said Benvenuti. “Wrestling in Atlantic City to end their careers is of course a happy time in their life, and ours as coaches. However, I definitely find myself feeling sad and emotional knowing they will soon be leaving us. No other coach and athlete spend more time together than a coach and wrestler. I have always made an investment into my athletes lives so that I can figure out what buttons to push and how to motivate them to achieve more. This coaching staff has really enjoyed working with, and getting to know these two perfect captains. 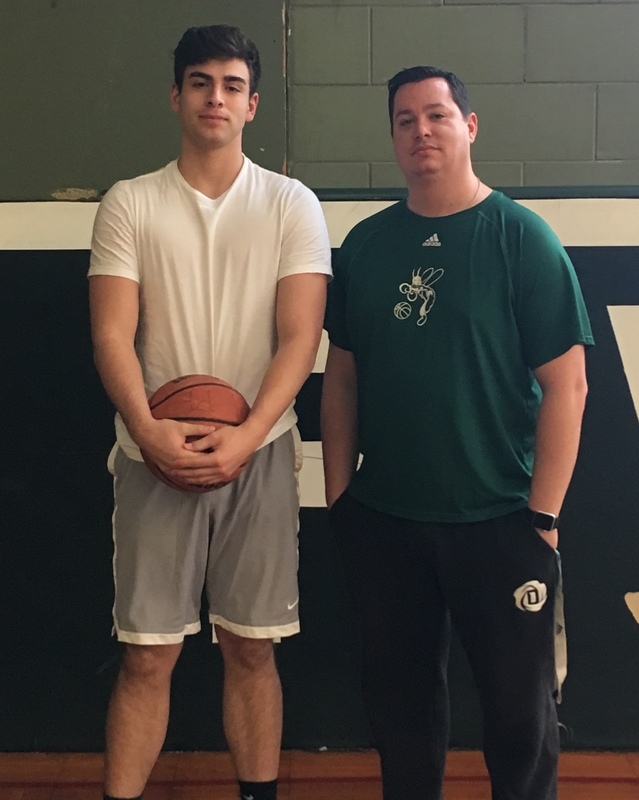 Always driven by family loyalty and succeeding academically, Passaic Valley’s High Tom Marretta has also established himself as one of the school’s most versatile and complete student-athletes. 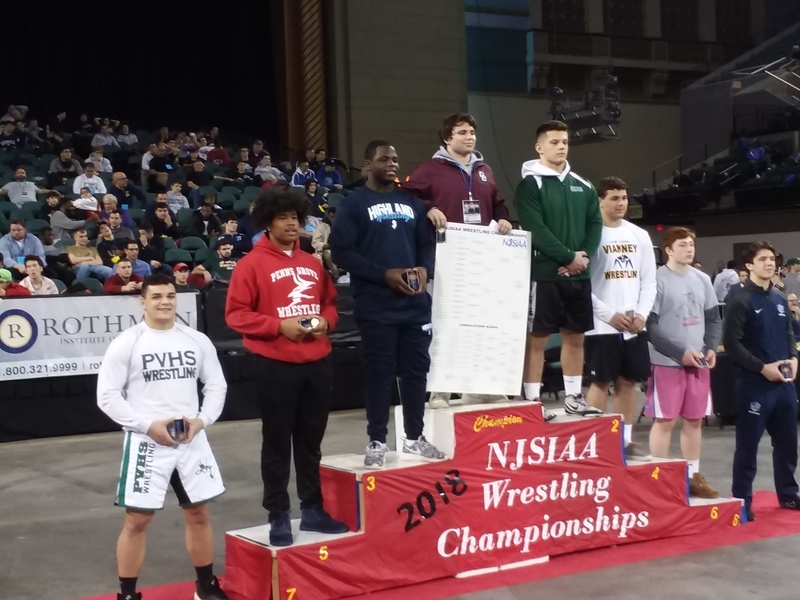 Marretta, a senior, joined elite company in PV’s proud wrestling heritage, by earning a medal at the NJSIAA championships last weekend, at Boardwalk Hall, in Atlantic City. He finished seventh in the state, at 220 pounds, and won his final bout, to culminate a 38-7 season. For his career, Marretta won 85 varsity matches. All in all, not bad for a young man who didn’t even begin wrestling until his freshman year. Marretta continued to excel on the gridiron for the Hornets, and his wrestling prowess also took hold. 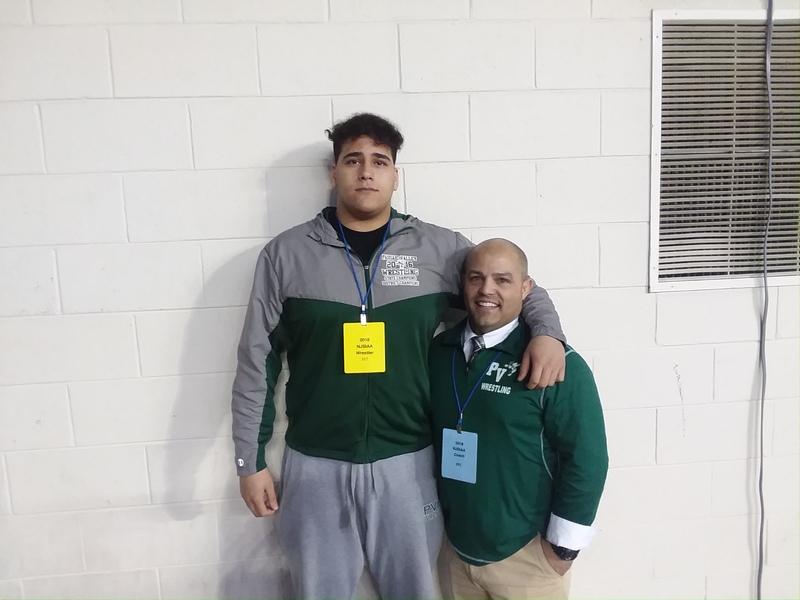 As a sophomore, he was on the varsity, where he hoped to compete at heavyweight, but Yousef Karmi defeated him in the wrestle off for the starting position. An injury to Karmi later in the 2015-2016 season gave Marretta a chance to wrestle, and he took advantage, finishing third at Region 4 and earning a berth in the state tournament, at heavyweight. With Karmi back last season, Marretta opted to wrestle at 220 pounds, meaning he had to lose about 35 to 40 pounds after football season and before certifying for wrestling. The son of Jennifer and Gaetano Marretta, Tom is an outstanding student. Marretta holds a GPA of 3.7 and has scored very high on his SAT’s. Marretta’s diligence is a credit to family values, according to Benvenuti. Tom has worked hard since the summer, having served as a team captain for football and wrestling. An All-Passaic County athlete in both sports, he hopes to relax a little for a week, or so. Benvenuti has no doubt Marretta will be a success in whatever he pursues. “Tom’s maturity, his leadership and work ethic, both in sports and more importantly with school, will certainly set him up for continued success,” said Benvenuti. “Coach Benvenuti has taught me so much,” said Marretta. “Everything I know about wrestling, came from J-Ben. To be on that podium, in Atlantic City last Sunday is one of the best experiences of my life. It was almost surreal being out there, with some great wrestlers on that podium. But Jermain was serious, and as of last week, it’s now official. Johnson is the new head coach of the Bucs. I’ve said it for a while, and I’ll stand by it. I don’t think Belleville High should have a football program anymore. That shipped long sailed, again in my opinion. The record speaks for itself. After those football wizards who made up the Board of Education in Belleville, back in 1996, decided that John Senesky wasn’t the answer any more, there’s been a whirlwind of coaches trying to turn this program around. Johnson will be the eighth different head coach at BHS in the last 22 seasons. Do the math. Twenty two in eight years? That’s not good. Again, the record speaks for itself. Since Senesky left following the ’96 season, Belleville’s overall record is 42-167. That’s an average mark of 2-8, per year, with seven different head coaches. That mark includes three winless seasons and one losing streak that extended three years, from the middle of the 2002 season until late in the 2005 campaign. There was one bright spot, in 2007 and 2008, when the program put together back-to-back winning regular seasons (5-4) and qualified for the NJSIAA playoffs for the first time in 23 years, in ’07. I often question the commitment of the players to the weight room, or to what it takes, in general to be good at this game. Coaches come, coaches go, and nothing really changes. 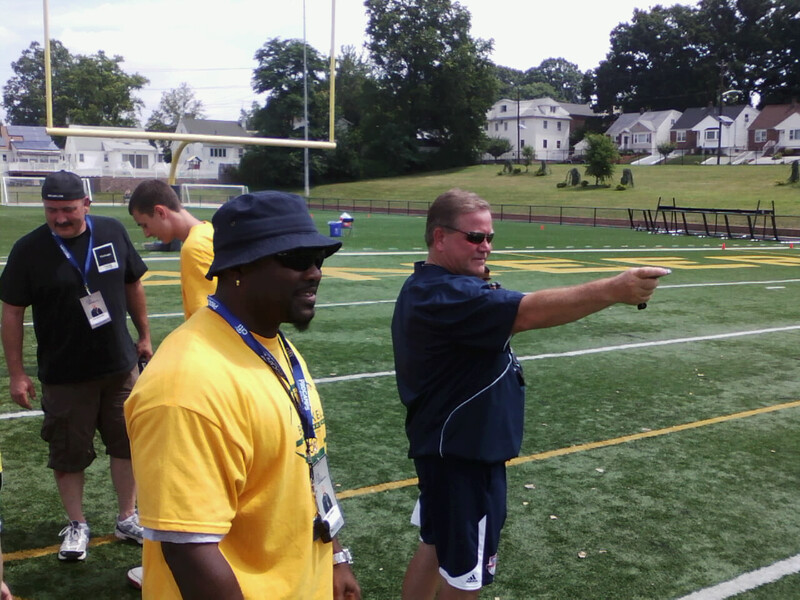 Jermaine Johnson, here with Notre Dame head football coach Brian Kelly, ironically at a football clinic at Belleville High, in the summer of 2013, will now run the BHS gridiron program. So now, it’s Jermain Johnson’s turn. Is he qualified? Absolutely. I first met him when he played high school football for one of my closest friends in this game, Chet Parlavecchio, at Bloomfield High from 1988-1990. He went on to play at Montclair State, and later was a member of the New Jersey Red Dogs, of the Arena Football League. Ironically, Jermain and Senesky have a history, as the two coached together at Montclair State, after Senesky left Belleville’s sidelines, in the late 1990’s. After Montclair State, Johnson would eventually get his first head coaching job, at Paterson Eastside, where he worked from 2009-2012 and had success. He then moved on to Wayne Hills, as the defensive coordinator, holding that job for five years (2013-2017). During that tenure, Hills was 38-17 and appeared in two state championship games, and won a title, in 2016. Getting back to a head coaching job was something he coveted, and when Belleville came calling, Jermain was ready for the challenge. It will be a challenge, for sure. The recreation football program is in need of a major overhaul, but the recreation director, Tom Agosta, is as hard working as they come and Tom should welcome Johnson’s help. There’s a new weight room at the high school, but who knows if anyone is using it? Again, Johnson, a big advocate of weight training, a la Senesky, will be completely on board. I still say Belleville is a soccer town, and shouldn’t play football anymore. But I also think Jermain Johnson is as good as they get. And if he thinks he can do something with this program, the more power to him. “JJ, are you nuts?” Maybe he is, but he could be the long-term answer for the Blue and Gold. I’ll be rooting for him, and hopefully, everyone in town will, too.